As we have witnessed earlier this month, significant snow events can make an appearance in Denver during the month of March and there have been a number of them in our past. Also not unusual and appearing are powerful, damaging winds. 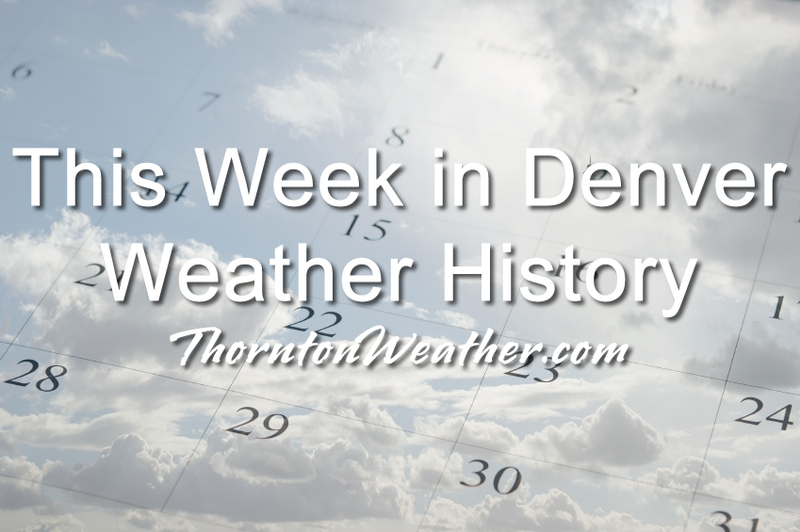 These types of events as well as thunderstorms, hail and even a tornado have occurred during this week in Denver weather history. In 1965…a vigorous cold front swept across metro Denver late on the afternoon of the 22nd with east-northeast winds gusting to 38 mph causing some blowing dust. Snowfall from the storm totaled 4.4 inches at Stapleton International Airport. Temperatures on the 22nd dropped from a maximum of 63 degrees to 18 degrees in just 10 hours and dipped to 3 degrees below zero on the morning of the 24th. Maximum temperatures warmed to only 19 degrees on the 23rd and 18 degrees on the 24th. In 1909…post-frontal rain on the 23rd changed to heavy snow during the evening and continued through the morning of the 24th. Snowfall totaled 13.8 inches. Rain and melted snow… Totaled 2.43 inches…which was the record greatest 24 hour precipitation ever recorded in March at that time. A thunderstorm of moderate intensity occurred on the 23rd in advance of the cold front. North winds were sustained to 27 mph overnight. In 1990…several hours of freezing drizzle covered roadways with a thin layer of “black ice” which caused nearly 100 traffic accidents across metro Denver. In Boulder…snow and freezing rain caused numerous accidents and brief power outages. Snow in Boulder ranged from an inch east of town to 4 to 5 inches near Table Mesa. At times thunder was heard during the snow. Snowfall totaled only 0.6 inch at Stapleton International Airport where northwest winds gusted to 30 mph on the 23rd. In 1995…high winds developed late on the 23rd and continued through the 24th. A few windows were blown out of a Denver high rise building…spraying glass on the sidewalks and streets below. Southeast winds gusted to 48 mph at Denver International Airport on the 23rd. In 1996…the third storm in 10 days brought heavy snow to the mountains…foothills…and metro Denver. Snowfall totaled 18 inches at Golden Gate Canyon and 10 inches at Nederland in the foothills. Across metro Denver… Snowfall ranged from 4 to 8 inches. At the site of the former Stapleton International Airport…snowfall totaled 6.5 inches with most of the snow occurring on the 24th. North winds gusted to 34 mph at Denver International Airport. As the storm moved east on the 24th and 25th… Blizzard conditions developed over northeastern Colorado closing both I-70 and I-76 east of Denver. In 2010…a powerful spring snowstorm swept across northern Colorado. The heaviest snowfall occurred in and near the Front Range foothills and deep upslope developed. The heavy…wet snow clung to tree limbs and power lines…which caused 36500 electrical outages throughout Denver and the surrounding metro area. Power outages also occurred in Douglas and Elbert counties. In addition…approximately 5 thousand travelers were stranded at Denver International Airport due to flight cancellations and delays. Initially… The snow fell at a rate of 2 to 4 inches per hour…between Boulder and Denver…bringing the evening rush hour to a complete halt. Countless motorists were stuck on U.S. Highway 36 for several hours. Other road closures included I-70…from Idaho Springs to Genesee and I-25 in both directions…from Lincoln Avenue south to Greenland… Or about 15 miles south of Castle Rock. In and near the Front Range foothills and Palmer Ridge…storm totals included: 26 inches at Coal Creek Canyon…23.5 inches…3 miles south of Evergreen; 22 inches at Aspen Springs…13 miles northwest of Golden and 3 miles west of Jamestown; 21.5 inches…3 miles north of Blackhawk…20 inches at Genesee; 16 inches near Nederland; 14 inches near Elizabeth and Strontia Springs dam; 13 inches at Bergen Park and 3 miles southeast of Indian Hills; 12.5 inches… 3 miles southwest of Conifer; 11.5 inches at St. Mary’s Glacier. In Denver and the surrounding suburbs…storm totals included: 15 inches at lone tree; 14 inches near Highlands Ranch; 13 inches near Louisville…12.5 inches at Aurora…Commerce City…Englewood and 5 miles west of Littleton; 12 inches at Erie and Greenwood Village; 11 inches at Ralston Reservoir and Westminster; 10.5 inches at the national weather service in Boulder…10 inches… 4 miles northeast of Castle Rock…Fredrick…Lakewood…3 miles southeast of Morrison and 4 miles southeast of Watkins; 9.5 inches…3 miles southeast of Denver; 9 inches in Broomfield…Lafayette…Northglenn and Thornton; 8.5 inches near Federal Heights; 8 inches in Arvada… Brighton and Wheat Ridge; 6 inches…5 miles southwest of Hudson. Officially…10.8 inches of snow was measured at Denver International Airport. In 1891…rain changed to snow and totaled 8.8 inches in downtown Denver. Most of the snow fell on the 24th. Winds were light. In 1964…heavy snowfall of 5.8 inches was measured at Stapleton International Airport. North-northeast winds gusted to 21 mph behind a cold front. In 1909…a major winter storm dumped 13.8 inches of snow over downtown Denver. In 1915…a cold front produced post-frontal winds to 41 mph. In 1919…some unusually soft but rather large hail fell with the beginning of precipitation from the first thunderstorm of the season early in the evening. Only a trace of rain was observed. In 1937…a light to moderate dust storm began at 1:30 pm and continued until 8:30 pm. The storm reduced the visibility to 3/4 mile at times. Northeast winds were sustained to 29 mph with gusts to 34 mph. In 1970…a vigorous cold front produced a northeast wind gust to 60 mph at Stapleton International Airport where 3.2 inches of snow fell following the frontal passage. The strong winds caused minor damage from Denver northward…and billows of blowing dust reduced visibility at times. Following the passage of the cold front…the temperature dropped 25 degrees in an hour from 65 to 40 degrees. In 1982…a strong cold front roared across metro Denver. Northeast winds gusted to 48 mph at Stapleton International Airport. The strong winds behind the front created a huge cloud of dust at least one thousand feet high…which briefly reduced visibilities to less than one mile. In 1987…near-blizzard conditions over northeastern Colorado closed both I-70 and I-76 east of Denver. While only a trace of snow fell in Denver…northeast winds gusted to 37 mph. In 1997…an early spring storm brought snow to metro Denver. The heaviest snow fell in the foothills and over the Palmer Divide. Snowfall at Conifer totaled 5 inches. A woman was killed when she lost control of her vehicle on snow packed and slick roads near Castle Rock. Snowfall totaled only 1.3 inches at the site of the former Stapleton International Airport. North winds gusted to 46 mph at Denver International Airport. In 1904…west bora winds sustained to 40 mph with gusts to 55 mph warmed the temperature to a high of 49 degrees on the 24th. Overnight…a cold front produced 4.5 inches of snow. The high temperature was only 34 degrees on the 25th. In 1955…a vigorous cold front with winds sustained to 34 mph and gusts to 39 mph briefly reduced the visibility to 2 miles in blowing dust at Stapleton Airport. Post-frontal heavy snowfall totaled 9.5 inches at Stapleton Airport where the maximum snow depth on the ground was 7 inches. In 1959…the second major spring storm in less than a week dumped 10 to 20 inches of wet snow across northeastern Colorado. Snowfall totaled 14.3 inches at Stapleton Airport where north winds gusted to 36 mph…causing near-blizzard conditions with visibilities frequently reduced to 1/2 mile in snow and blowing snow. Many travelers were marooned when trains…planes…and buses were unable to make their schedules. Utility lines were again damaged as a result of the storm. In 1874…the wind blowing in gusts from the west-northwest filled the air with dust so dense that only the houses in the immediate neighborhood of the weather station could be recognized. The brisk winds continued through the afternoon. In 1886…heavy snowfall of 6.5 inches occurred in the city. In 1896…northwest winds sustained to 58 mph with gusts to 65 mph warmed the temperature to a high of 70 degrees. In 1911…west winds were sustained to 43 mph. The Chinook winds warmed the temperature to a high of 65 degrees. In 1925…northwest winds were sustained to 41 mph with gusts to 46 mph. In 1950…strong Chinook winds gusted to 50 mph at Stapleton Airport. In 1976…3.4 inches of snow fell at Stapleton International Airport where northeast winds gusted to 46 mph. The strong winds at 20 to 35 mph all day produced a rare “snirt” storm when blowing dust and dirt became mixed with snow and blowing snow reducing the visibility to as low as 1/4 mile at Stapleton International Airport. In 1984…1 to 4 inches of new snow fell across metro Denver. Icy roads contributed to many accidents. The most hazardous conditions occurred in the foothills west of Denver. Both I-70 and U.S. 40 were closed at the height of the Sunday afternoon ski rush…causing delays of many hours. Snowfall totaled only 1.0 inch at Stapleton International Airport with only a trace on the ground due to melting. In 1988…high winds in the mountains spread over metro Denver. A wind gust to 75 mph was noted in Boulder where a traffic light was downed. Power outages were reported in Boulder County. Northwest winds to 46 mph were recorded at Stapleton International Airport. In 1899…a major storm dumped 13.1 inches of heavy snow over downtown Denver. Rain changed to snow around mid- morning on the 25th. Snowfall became heavy and continued until late evening on the 26th. North to northeast winds gusted to 30 mph on both days. The cold air mass plunged temperatures from a high of 55 degrees on the 25th to a low of 8 degrees on the 26th. In 1995…a potent early spring storm produced heavy snow in the mountains…but skipped over metro Denver…before producing blizzard conditions and 6-foot drifts over eastern Colorado…causing the closure of I-70 and other highways. Only 0.7 inch of snow fell at the site of the former Stapleton International Airport. North winds gusted to 40 mph at Denver International Airport on the 25th. In 2001…a persistent band of moderate to heavy snow showers with a few embedded thunderstorms formed in the foothills around Estes Park and spread to the southeast across Boulder and Denver and on the plains to the east of Denver. Thunder and snow was reported at Jefferson County…Centennial…and Denver International Airports during the evening of the 25th. Snowfall totals included: 7 inches at Boulder and Louisville; 6 inches at Broomfield…Niwot…and Westminster; 5 inches at Eldorado Springs…Nederland…and near Strasburg. Only 2.1 inches of snow fell at the site of the former Stapleton International Airport. In 1904…heavy snowfall totaled 7.0 inches in downtown Denver. In 1899…a major winter storm dumped 11.3 inches of snow over downtown Denver. In 1910…west winds were sustained to 42 mph. A snow shower produced a trace of snow. In 1935…a severe dust storm swept across the city. The dense dust blew in on a gale from the east-northeast. The dust “bank” was first visible on the northeastern horizon at about 2:00 pm. It advanced toward the city as a rolling…swirling…yellowish-to smoke-black cloud. At 2:06 pm…the cloud of dust enveloped the station. Before the storm the visibility was unlimited. At 2:08 pm…the visibility was reduced to 1/8th mile. By 2:25 pm…the visibility was increasing and was above 1000 feet at 3:10 pm. Thereafter…the sun appeared as a dim “ball of fire” at times. The dust was partially gone at 8:30 pm. During the storm…northeast winds were sustained to 32 mph with gusts as high as 35 mph. In 1971…the highest recorded temperature in March…84 degrees…occurred. This was the highest temperature recorded so early in the season. Previously…84 degrees had not been reached until April 21st. The temperature also exceeded the previous daily record of 75 degrees set in 1960. Strong northwest Chinook winds gusting to 37 mph at Stapleton International Airport were partially responsible for causing the extremely warm weather so early in the season. In 1985…strong winds occurred along the foothills. A wind gust to 76 mph was recorded in Boulder. A dust storm produced by the strong winds caused a 35-car pileup on I-25 north of Denver. In Denver…the high winds blew out windows in a few downtown buildings. West winds gusted to 52 mph at Stapleton International Airport. In 1993…strong winds from high based thunderstorms blew a roof off an Englewood business onto several parked cars. The winds also caused half of a furniture warehouse roof to collapse in north Denver…ripped a mechanical shed off the roof of a building in downtown Denver…and downed power lines in Commerce City. Wind gusts ranging from 55 to 68 mph were recorded. At Stapleton International Airport… Where no thunder was heard…a microburst wind gust to 55 mph briefly reduced the visibility to zero in blowing dust. In 1994…heavy snow fell in the foothills west of Denver and over the Palmer Divide to the south of metro Denver. Snowfall totaled 11 inches at both the Eldora Ski Area and at Idaho Springs. Only 1.3 inches of snowfall were measured at Stapleton International Airport where north winds gusted to 28 mph. In 2006…post-frontal strong winds quickly dissipated the dense morning fog across metro Denver. West to northwest winds were strong and gusty from mid-morning until sunset. West winds were sustained to 37 mph with gusts to 52 mph at Denver International Airport. In 1886…heavy snowfall totaled 7.1 inches in downtown Denver. In 1911…post-frontal north winds were sustained to 48 mph on the 26th and to 47 mph on the 27th. In 1931…a cold front brought snow and very cold weather to the city. Snowfall totaled 7.3 inches over downtown Denver with most of the snow…6.4 inches…occurring on the 26th… When northwest winds were sustained to 38 mph with gusts to 44 mph. High temperature of 31 degrees on the 26th equaled the low temperature of the previous day as the temperature plunged to a low of 1 degree below zero. High temperature of only 15 degrees on the 27th was a record low maximum for the date. Low temperature of 2 degrees below zero on the 27th was not a record. In 1975…a major pre-Easter blizzard…the worst since the vicious storm of 1949…battered northeastern Colorado and left livestock losses in millions of dollars…but metro Denver escaped the main brunt of the storm and received only 5.0 inches of snowfall. North winds gusted to 38 mph at Stapleton International Airport where temperatures plunged from a high of 50 degrees to 18 degrees by midnight on the 26th. In 1991…heavy snow fell over portions of the eastern foothills with 9 inches recorded at Lake Eldora west of Boulder. The snow spread across metro Denver…but snowfall totaled only 1.7 inches at Stapleton International Airport where north to northeast winds gusting to 31 mph on both days produced some blowing snow. In 1873…a severe wind and sand storm damaged buildings in the city. At 11:00 am brisk west winds blew clouds and sand into the city…which continued for an hour when it abated some. At 2:00 pm another terrific sand storm blew a gale from the west. The storm lasted 30 minutes…but winds remained brisk the rest of the day. In 1884…a windstorm struck the city at mid-morning and lasted until midnight. Sustained winds of 40 to 60 mph unroofed some buildings and blew others down. A few people were injured…but none fatally. In 1896…southwest winds sustained to 60 mph with gusts as high as 70 mph warmed the temperature to a high of 59 degrees. In 1905…north winds were sustained to 40 mph. In 1939…freezing drizzle deposited glaze as thick as 1/4 inch from late morning through late afternoon. No damage was reported. In 1956…strong and gusty winds raked metro Denver all day behind a pacific cold front. Wind gusts to 58 mph at Stapleton Airport briefly reduced the visibility to 1 mile in blowing dust. In 1987…snow and wind closed many highways across eastern Colorado for the second time in less than a week. I-25 was closed south of Denver and I-70 was closed east of Denver for nearly 48 hours. Metro Denver only received around 4 inches of new snow…but snow and blowing snow caused air traffic delays of up to 3 hours at Stapleton International Airport where snowfall totaled 3.5 inches and north winds at 15 to 25 mph gusted to 40 mph. Temperatures hovered in the 30’s for much of the day. In 1997…strong winds developed behind a fast moving cold front. While the highest winds were north and northeast of metro Denver…northwest winds gusting to 56 mph at Denver International Airport produced widespread blowing dust…which briefly reduced the visibility to 2 1/2 miles. In 1951…heavy snowfall totaled 6.5 inches at Stapleton Airport where north winds gusted to 38 mph on the 27th and 41 mph on the 28th. In 1972…heavy snowfall of 6.2 inches was measured at Stapleton International Airport…where northeast winds gusted to only 21 mph. In 1980…a major blizzard struck the northeastern Colorado plains…closing both I-70 and I-76 to the east of Denver for a time. Some areas received 1 to 2 feet of snow. Drifts were 4 to 8 feet high. The storm killed many young livestock. At Stapleton International Airport…snowfall totaled 6.7 inches from the storm and north winds gusted to 29 mph. In 2002…high winds developed in the foothills west of metro Denver. Winds gusted to 81 mph near Fritz Peak…72 mph at Rollinsville…and 70 mph at Blackhawk. West winds gusted to 51 mph on the 27th and to 45 mph on the 28th at Denver International Airport where the temperature warmed to a high of 69 degrees on the 28th. In 1948…high winds raked Boulder. A wind gust to 75 mph was recorded at Valmont. Sustained winds in excess of 35 mph were estimated in Boulder. Minor damage was reported. In 1961…heavy snowfall totaled 9.5 inches at Stapleton Airport over the 3 day period. Most of the snow…5.3 inches…fell on the 28th. Winds were generally light and gusted to only 22 mph from the north. In 1886…the lowest recorded temperature in March…11 degrees below zero…occurred. In 1911…a thunderstorm produced snowfall of 0.4 inch…which was the only measurable snowfall of the month…making the month the second least snowiest March on record. In 1962…a vigorous cold front produced strong winds across eastern Colorado. North winds gusted to 46 mph at Stapleton Airport where visibility was briefly reduced to 3/4 mile in blowing dust. A construction worker was injured in Aurora when he was struck by a wind-blown piece of plywood. In 1891…rain changed to snow and totaled 9.7 inches in the city. Northeast winds were sustained to 12 mph with gusts to 28 mph on the 28th. In 1910…a strong cold front brought much wind…rain…and snow to the city. Rain on the 28th changed to snow early on the 29th. Snowfall totaled only 2.8 inches…but north winds were sustained to 50 mph on the 29th. Precipitation from the storm totaled 0.96 inch. In 1994…moist upslope winds combined with an upper level system to dump 5 to 7 inches of snow along the eastern foothills and across metro Denver. Snowfall totaled 6.3 inches at Stapleton International Airport where northeast winds gusted to 39 mph. Thirteen inches of new snow were measured at the Eldora Ski Area west of Boulder. In 1949…a major winter storm dumped 11.3 inches of snow over downtown Denver. Snowfall totaled 10.4 inches at Stapleton Airport. North to northeast winds were sustained to 17 mph. In 1985…a slow moving snow storm moved across the state. Denver received only 4.0 inches of snowfall with amounts in the foothills totaling 1 to 2 feet. Still…this was enough snow in Denver to cause flight delays of up to 6 hours at Stapleton International Airport on the night of the 29th. East winds gusted to 28 mph on the 28th. In 1887…west winds sustained to 44 mph warmed the temperature to a high of 62 degrees. In 1921…post-frontal northeast winds were sustained to 46 mph with gusts to 52 mph. In 1925…southeast winds were sustained to 46 mph with gusts to 48 mph. These were the strongest winds of the month that year. The winds warmed the temperature to a high of 72 degrees. In 1934…a construction worker was killed by lightning as he walked with a shovel on his shoulder along Cherry Creek in the city. The thunderstorm produced light rain. In 1967…a southwest wind gust to 52 mph was recorded at Stapleton International Airport. The warm Chinook winds warmed the temperature to 79 degrees equaling the record for the date. In 1979…a tornado touched down 4 miles southwest of Parker… But caused no reported damage. In 1998…four children attending a birthday party in Denver were injured when an apparent dry microburst produced a sudden strong wind gust which blew an inflatable playhouse they were occupying into a neighbor’s yard. The playhouse scraped the roof of the host’s two-story house…then landed in the adjoining yard. The children were treated for minor head injuries and cuts. In 1938…overnight heavy snowfall was 6.3 inches over downtown Denver. In 1982…strong winds buffeted metro Denver…breaking windows and damaging roofs. Wind gusts to 90 mph were recorded in Boulder and 51 mph at Stapleton Airport. The strong winds flattened a condominium under construction in Lakewood. In 1991…1 to 6 inches of snow fell across metro Denver with the heaviest snow confined to the foothills. Six inches of snow was recorded at South Platte in the foothills southwest of Denver and 3 inches at Castle Rock. Snowfall totaled only 0.7 inch at Stapleton International Airport where northeast winds gusted to 33 mph on the 29th. In 1970…snowfall totaled 6.0 inches at Stapleton International Airport. Heavy snow accumulation in Boulder on the 29th caused the collapse of a carport at an apartment building…damaging 11 automobiles. Northeast winds gusted to 24 mph at Stapleton International Airport. In 1895…rain changed to sleet…then snow…and totaled 8.0 inches in downtown Denver. Strong post-frontal northeast winds were sustained to 48 mph with gusts to 61 mph. Temperatures hovered around 30 degrees all day. In 1968…microburst winds associated with virga and brief light rain gusted to 46 mph at Stapleton International Airport. In 1983…winds gusted to 82 mph at the National Center for Atmospheric Research in Boulder with peak gusts of 70 to 80 mph in the foothills. Minor damage occurred at a construction site and to some homes in Boulder. West winds gusted to 39 mph at Stapleton International Airport. In 1896…heavy snowfall totaled 7.5 inches in downtown Denver. Northwest winds gusted to 26 mph. In 1897…rain changed to snow during the early morning of the 30th and totaled 6.2 inches before ending during the late morning of the 31st. Northwest winds were sustained to 35 mph with gusts to 46 mph. In 1929…heavy snowfall of 7.0 inches was recorded over downtown Denver. Northwest winds were sustained to 23 mph on the 30th. In 1953…heavy snowfall totaled 8.6 inches at Stapleton Airport where northeast winds gusted to 23 mph. In 1955…a vigorous cold front produced north winds at 40 mph with gusts as high as 54 mph at Stapleton Airport. Rain and snow showers and blowing dust accompanied the front. Snowfall totaled only 0.1 inch at Stapleton Airport on the 31st. In 1988…snow began falling on the afternoon of the 30th and continued through the 31st…burying metro Denver. Twelve to 18 inches of snow fell in the foothills to the west of Denver and Boulder with 6 to 12 inches across the rest of metro Denver. The storm disrupted aircraft operations at Stapleton International Airport where snowfall totaled 7.1 inches and north winds gusting to 32 mph reduced the visibility to less than 1/4 mile at times…causing air traffic delays of 2 to 3 hours. In 2000…heavy snow once again developed over the foothills and the higher terrain to the south of metro Denver. Snowfall totals from the storm included: 16 inches atop Squaw Mountain…15 inches near Rollinsville…13 inches near Evergreen…12 inches near Morrison…11 inches in Coal Creek Canyon…10 inches near Blackhawk and in Eldorado Springs…9 inches at Ken Caryl Ranch and Larkspur… And 8 inches near Elizabeth. Snowfall totaled only 4.1 inches at the site of the former Stapleton International Airport. North winds gusted to 32 mph at Denver International Airport on the 30th. In 2005…a strong spring storm intensified over the eastern plains of Colorado and produced near-blizzard conditions to the east and southeast of Denver overnight. North to northwest winds from 20 to 35 mph with gusts to 50 mph produced extensive blowing snow and caused near zero visibilities at times and snow drifts from 2 to 4 feet in depth. Snowfall amounts included: 12 inches near Bennett…8 inches around Castle Rock… 7 inches near Sedalia…and 6 inches near Parker. Only 0.3 inch of snow was reported at Denver Stapleton. At Denver International Airport…north winds gusted to 37 mph on the 30th and 36 mph on the 31st. In 2014…on the evening of the 30th…high based showers and thunderstorms produced microburst winds over northern Jefferson…eastern Boulder and southwest Weld Counties. Peak wind reports included: 77 mph at White Ranch Open Space; 72 mph…2 miles north of Longmont; 67 mph near Erie and Firestone; 60 mph near Mead and 59 mph…5 miles northwest of Henderson; with 53 mph at Denver Internatinal Airport. The wind downed power lines in Weld County which sparked a small fire. High winds then developed in the Front Range Foothills and Urban Corridor through the morning of the 31st. Peak wind gusts included: 98 mph near Gold Hill; 77 mph near Eldorado Springs; 61 mph at Centennial Airport; 59 mph at Buckley Air Force; with 44 mph at Denver International Airport. This entry was posted on Sunday, March 24th, 2019 at 6:25am MDT and is filed under Weather History. You can follow any responses to this entry through the RSS 2.0 feed. You can skip to the end and leave a response. Pinging is currently not allowed.